The handicapping process does not end when the bets are made; it ends by reviewing the results of the races that were bet and analyzing the handicapping process to determine if anything was missed. 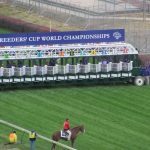 After taking a day to recover, I looked back at the 2011 Breeders’ Cup results and came up with the top four things to take away from the last Breeders’ Cup at Churchill Downs. Every horseplayer has watched or bet a race that was won by a horse that appeared to have no chance of winning. The horse may have appeared to be too slow, was running at the wrong distance or had not run well in months or years. The horse triggers large payouts and causes great frustration. After reviewing the past performances nothing points to the horse as a winner. The result is still implausible but that is perfectly acceptable. Horse races are run by living breathing animals and ridden and trained by humans. The horses are not machines and the jockeys and trainers are imperfect so it is inevitable that from time to time a race will produce an un-explainable result. This scenario occurred not once but twice on Breeders’ Cup Saturday. The first impossible to come up with horse was Afleet Again in the Breeders’ Cup Marathon. Afleet Again was the least likely winner of the Breeders’ Cup Marathon after a subpar 2011 that saw him go winless in eight starts including two losses in allowance races. Afleet Again was also unproven at the distance and based on speed figures was the slowest horse in the race. Despite all of these negative factors Afleet Again won the Breeders’ Cup Marathon by a comfortable 2 ¼ lengths at odds of 41 /1. The second improbable winner was Court Vision in the Breeders’ Cup Mile. Court Vision was the least likely winner in the Breeders’ Cup Mile after a lackluster 2011 season. Similar to Afleet Again Court Vision was winless in 2011 and based on speed figures was the slowest horse in the race. Court Vision was coming off a mediocre seventh place finish in the Woodbine Mile yet he managed to blow past three-time defending champion Goldikova and hold off Turallure (winner of the aforementioned Woodbine Mile) to post the biggest upset in the twenty seven year history of the Breeders’ Cup Mile. Even after the race was run it was impossible to make a case for Court Vision. After reviewing the past performance of each horse and knowing they had won their respective races I still could not find a reason to bet either one of them but guess what? That was perfectly fine. Some horses prefer one track over all others or in extreme cases only run well at one particular track. These horses are often referred to as a “horse for the course.” This angle plays out everyday at tracks across the country. 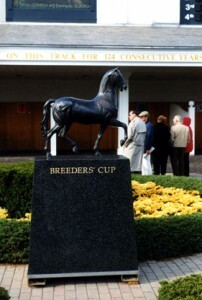 This year’s Breeders’ Cup Turf Sprint was won by Regally Ready, a Churchill Downs “horse for the course,” who was two for two in turf sprints at Churchill Downs prior to the race. The “Horse for Course Angle” has become a potent handicapping factor for the Breeders’ Cup Turf Sprints as it has produced all four winners of the race [through 2011]. Chamberlain Bridge won the 2010 Breeders’ Cup Turf Sprint after compiling a record of three wins and a second from four turf sprints at Churchill Downs. California Flag won the 2009 Breeders’ Cup Turf Sprint on Santa Anita’s downhill turf course and had previously won two of four starts over the course. Desert Code, who I mentioned in my post about multi-ticket betting strategy, won the 2008 Breeders’ Cup Turf Sprint on the same downhill turf course and had won three of five turf sprints at Santa Anita. 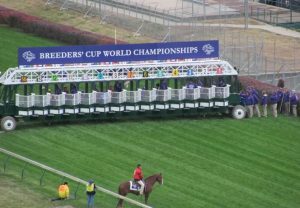 The Breeders’ Cup returns to Santa Anita in 2012 and once again the Breeders’ Cup Turf Sprint will be run on the unique downhill turf course. The downhill turf course is notorious for producing “horse for the course” winners so it will pay to give special consideration to horses that have won or performed well over the course in the past. Betting a horse “turning-back” in distance is one of the oldest angles in the book. To fit the angle a horse simply needs to be running in a race at a shorter distance than its previous race. The most common example is a horse going from a route to a sprint, such as from 1 1/16 miles to seven furlongs, but the angle also works for horses “turning-back” in distance from a route to a shorter route . Caleb’s Posse, Shackleford and Tres Borrachos completed the trifecta in the Breeders’ Cup Dirt Mile this year. All three fit the “tum-back angle.” Caleb’s Posse and Shackleford were exiting the 1 1/16 miles Indiana Derby and Tres Borrachos prepped for the Breeders’ Cup Dirt Mile in the 1 1/8 miles Goodwood. The “Turn-back Angle” has become quite possibly the most important handicapping factor for the Breeders’ Cup Dirt Mile as it has produced the winner of all five runnings of the race [through 2011]. Dakota Phone won the 2010 Breeders’ Cup Dirt Mile after running in the 1 1/8 miles Goodwood. Furthest Land won the 2009 Breeders’ Cup Dirt Mile after prepping in the 1 1/8 miles Kentucky Cup Classic. Albertus Maximus won the 2008 Breeders’ Cup Dirt Mile after running in the 1 1/8 miles Goodwood. Corinthian won the 2007 Breeders’ Cup Dirt Mile after competing in the 1 1/8 miles Woodward. One day a horse may win the Breeders’ Cup Dirt Mile after running in a sprint race but until the trend is reversed it pays to give preference to horses “turning-back” in distance. Favorites in horse racing are normally associated with unexciting payoffs, however when combined with a few upsets they can produce massive payouts. The six Breeders’ Cup races on Friday (2011) made up the Pick 6. Three of those races were won by the post time favorite (Secret Circle in the Breeders’ Cup Juvenile Sprint, My Miss Aurelia in the Breeders’ Cup Juvenile Fillies and Royal Delta in the Breeders’ Cup Distaff), the other three were won by 6/1 Stephanie’s Kitten (Breeders’ Cup Juvenile Fillies Turf), 20/1 Musical Romance (Breeders’ Cup Filly and Mare Sprint) and 27/1 Perfect Shirl (Breeders’ Cup Filly and Mare Turf) resulting in a Pick 6 payout of $444, 571. The last four Breeders’ Cup races made up the Pick 4. Two favorites (My Miss Aurelia and Royal Delta) combined with the aforementioned 20/1 Musical Romance and 27/1 Perfect Shirl produced a Pick 4 payout of $23,428 . In both sequences favorites won half of the races which proved that it is not necessary to beat the favorite in every race to win a substantial amount of money. Although these points relate directly to the Breeders’ Cup each can be applied to everyday handicapping. The most important lesson however is that just like horses are not machines handicappers should not bet like machines. Automatic bets should not be placed on horses that meet the criteria outlined above; they should be one factor to consider in the handicapping process. 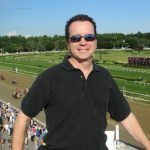 Sound handicapping involves evaluating all of the available information and using that information to bet the horse that figures to win the race at hand. While the Classic, Distaff, Mile and Turf will rightfully garner the majority of the Saturday headlines, the other five Breeders’ Cup races will be filled the very best equine talent, with several championships lying in the balance. The Maker’s Mark Breeders’ Cup Filly & Mare Turf, run at 1 3/8 miles, is expected to be led by Peter Brant’s divisional leader SISTERCHARLIE (IRE), who qualified for the race when she won Arlington Park’s “Win and You’re In” Beverly D. (GI) August 11 for trainer Chad Brown, who could also start FOURSTAR CROOK and SANTA MONICA (GB). Sunderland Holdings’ SEA OF CLASS (IRE) won the “Win and You’re In” Darley Yorkshire Oaks (GI) August 23 at York to gain an entry for trainer William Haggas and rates the best of a European contingent that could also include EZIYRA (IRE), MAGIC WAND (IRE) and WILD ILLUSION (GB). The one-turn Breeders’ Cup Dirt Mile is shaping up as a tremendous race, as Hronis Racing’s CATALINA CRUISER, who earned a berth into the race when he won Del Mar’s “Win and You’re In” Pat O’Brien (GII) August 25 for trainer John Sadler and has won his four career starts by 18 ½ lengths, rates as one of the most talented horses in training. Waiting in the wings is multiple Grade I winner CITY OF LIGHT and the undefeated ARMY MULE, on the comeback trail after suffering a minor injury shortly after winning Aqueduct’s Carter (GI) by 6 ¼ lengths April 7. Defending Dirt Mile winner BATTLE OF MIDWAY made his return from retirement and was second in the Pat O’Brien and is also pointing to the race. The six-furlong TwinSpires Breeders’ Cup Sprint is expected to be led by Ray Mamone’s IMPERIAL HINT, who aired in Saratoga’s Alfred Vanderbilt (GI) July 28 for trainer Luis Carvajal, while LIMOUSINE LIBERAL and RANSOM THE MOON qualified for the race with wins in this summer’s “Win and You’re In” Belmont Sprint Championship (GII) and “Win and You’re In” Del Mar’s Bing Crosby (GI), respectively. Defending Sprint winner ROY H is also expected, as are Grade I winners PROMISES FULFILLED and WHITMORE and multiple graded stakes winner X Y JET. The Breeders’ Cup Filly & Mare Sprint, run at seven furlongs, looks to have a solid favorite in Cicero Farm’s MARLEY’S FREEDOM, who earned a berth into the race with her win in Saratoga’s “Win and You’re In” Ballerina (GI) August 25 for trainer Bob Baffert. STORMY EMBRACE earned a berth into the race in the “Win and You’re In” Princess Rooney (GII) in June, while multiple graded stakes winners AMERICAN GAL, FINLEY’SLUCKYCHARM, LEWIS BAY and MIA MISCHIEF are also pointing to the race. The Breeders’ Cup Turf Sprint, run at five furlongs, is expected to draw a deep field, with Patricia Generazio’s homebred DISCO PARTNER, who qualified for the race when he won Belmont’s “Win and You’re In” Jaipur (GII) in June for trainer Christophe Clement, looking to better his third-place run in last year’s renewal at Del Mar. Defending champion STORMY LIBERAL headlines the rest of an American contingent that could also include BELVOIR BAY (GB), BUCCHERO, LADY ALEXANDRA, PURE SENSATION, and VISION PERFECT, while the Europeans could send BLUE POINT (IRE), CORINTHIAN KNIGHT (IRE), EL ASTRONAUTE (IRE).